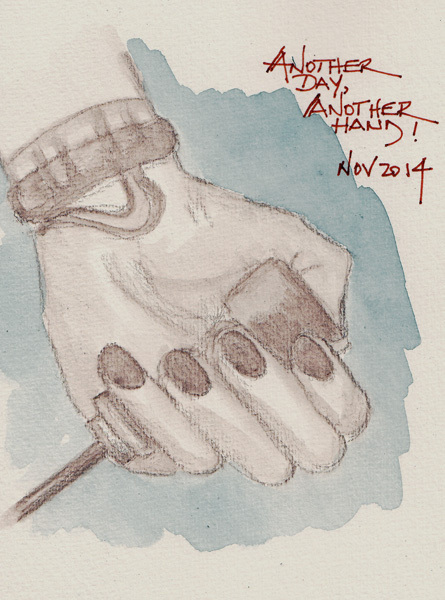 My blog post today recounts two museum experiences this week. The Neue Galerie is exhibiting Egon Schiele drawings and paintings, and I love to draw his figures, even the tortured looking ones. 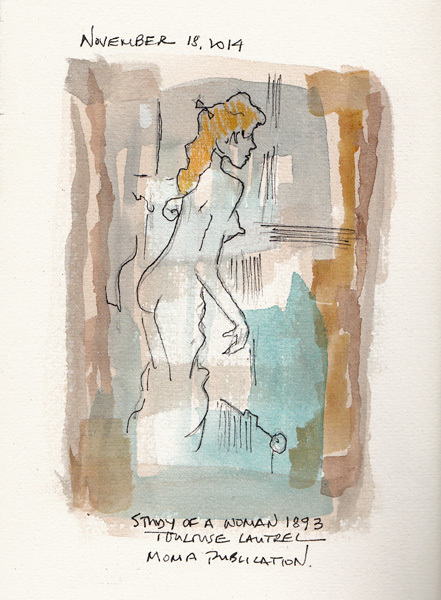 This figure was drawn over a prepainted page. When I'm away from home, I use up the extra liquid watercolor paint so I can close the palette by brushing it on sketchbook pages, starting on the last page of my watercolor sketchbook. 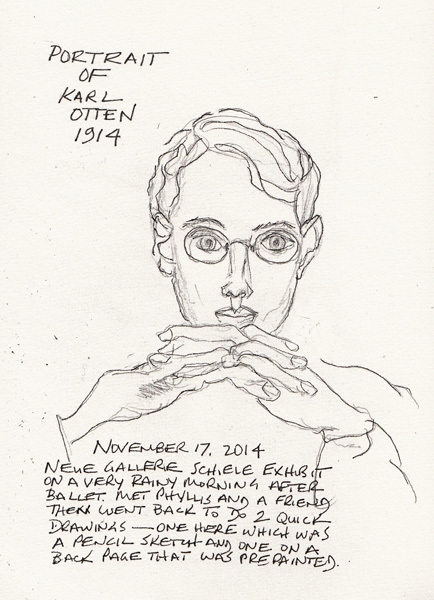 At the very beginning of the exhibit I was really attracted to the very clean lines of this portrait of Karl Otten, and went back to try to capture it for myself. 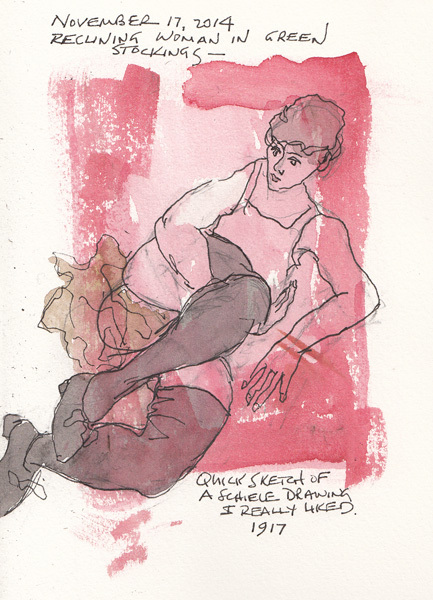 Someday soon I may return to the exhibit just to draw several pages of Schiele hands! MoMA has a Toulouse-Lautrec Print exhibit that doesn't end until March. 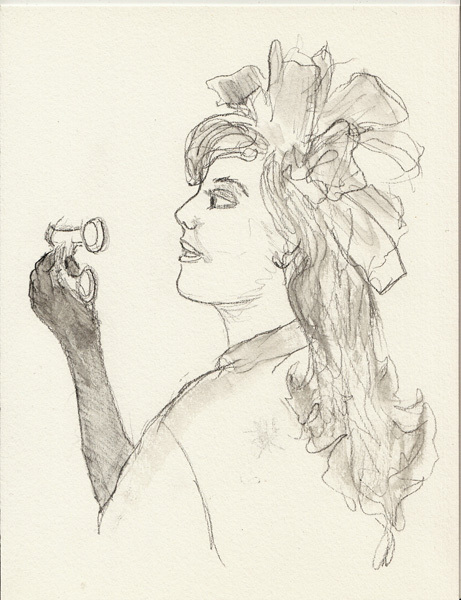 This month they announced twice monthly figure drawing sessions associated with the exhibit and the first model and the props really captured the Café Society that Toulouse-Lautrec loved. While I was waiting for the session to begin, I made a quick sketch from the artist book on my table on another prepainted page. 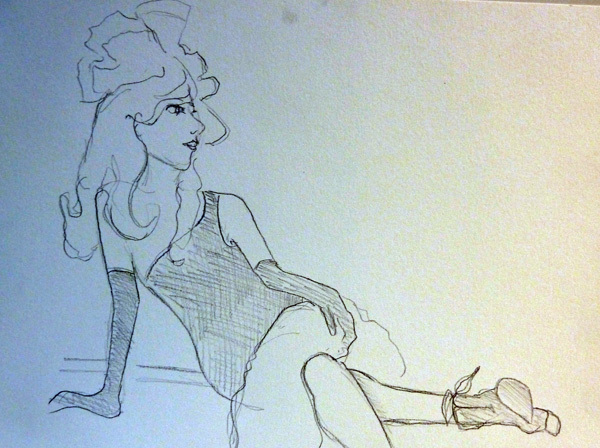 I'm posting the first few and last few figure drawings that I did. 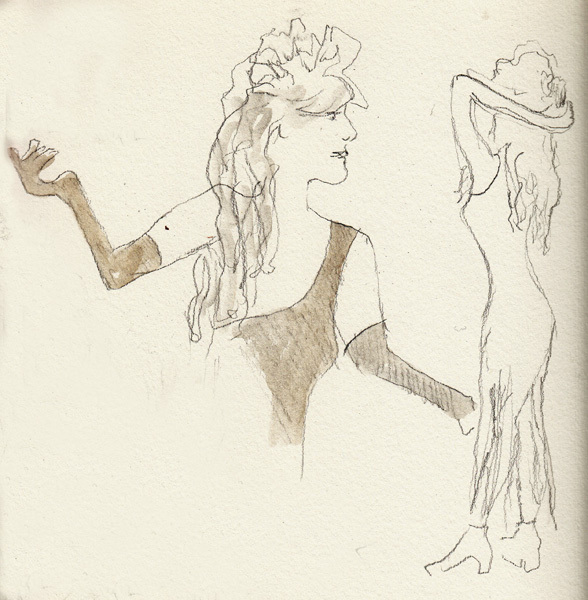 The one on the right was a one minute warm-up and the only one I sketched with her form-fitting, one-shoulder black knit dress with very long fringe and black bootie. In the one on the left you can see her long black gloves and the tulle fascinator she wore on her head. There were café props - cocktails, champagne, hats, cane, boa to name a few. These were the last few drawings I did - each not more than 5 minutes. The Art Educator really structured the experience - and the 90 minutes moved along very quickly. The museum will continue these sessions twice monthly through March. 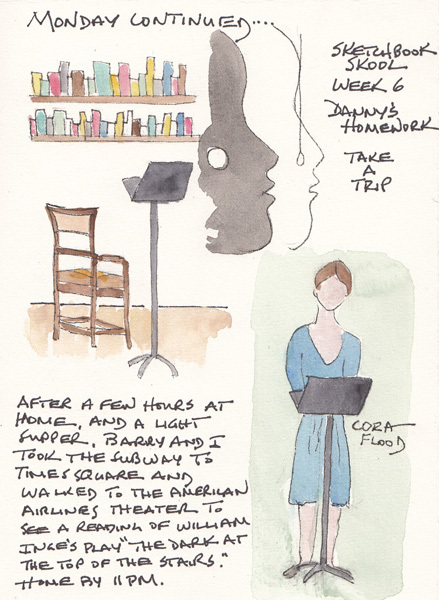 Danny Gregory was the last artist in the 6 week Sketchbook Skool Semester 3 "Storytelling" online course. He moved from LA to NYC immediately before, driving the entire way. So his sketchbook tours and demonstrations were all from his cross-country journey. His parting gift to us was a full PDF copy of his travel journal! Our homework was to take a trip, even around our home or neighborhood, and to document it in pictures and words. 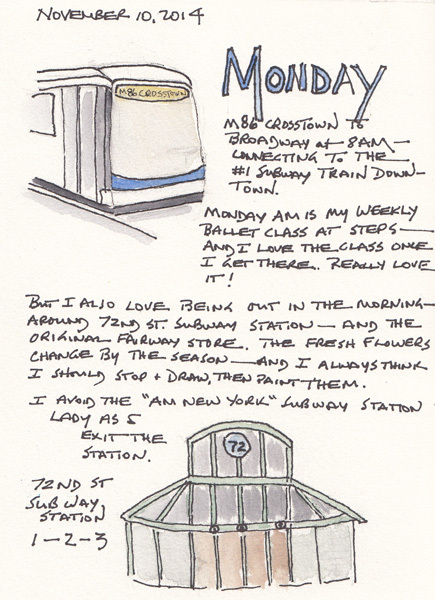 My journey was one day in my life - and I have 3 Sketchbook pages for the "trip." I left my apartment at 8AM, and took a bus and subway to my ballet class. 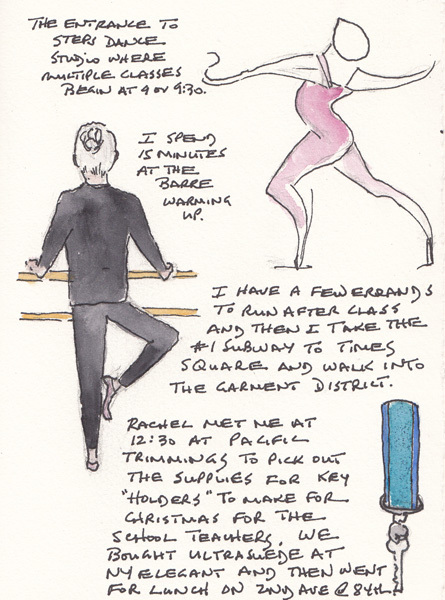 After ballet, I did a few errands and then took the Subway to the NYC Garment District to meet my daughter who needed advice on supplies to make for her childrens' teachers' holiday presents. We had lunch on the Upper Eastside and then I returned home - leaving several hours later to go to the Theater District in midtown for a play reading. Here are the pages - the writing is probably unintelligible! The part of Cora Flood was played by Annie Parisi who I really love! I took Sketchbook Skool Semesters 2 and now 3. Even though I belong to Everyday Matters, and am familiar with many of the teachers, I find the format of the course incredibly interesting. 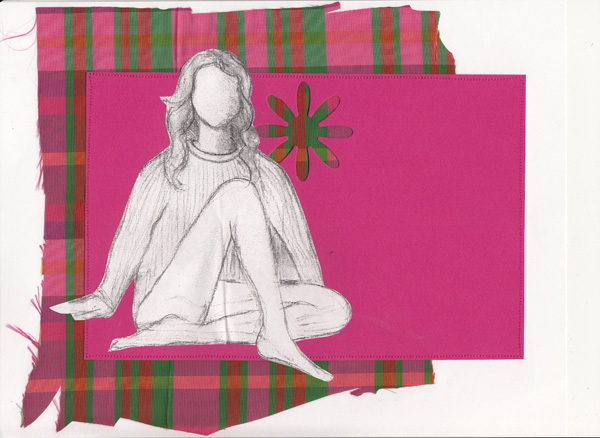 This semester I still need to work on homework from my imagination by Mattias Adolphson, A poster or book cover from Jean-Christophe Defline, and drawing bodies in motion like Veronica Lawlor. These are wonderful challenges for me and should keep me busy until Semester 4. Can't wait for the announcement of the next theme and lineup of teachers. 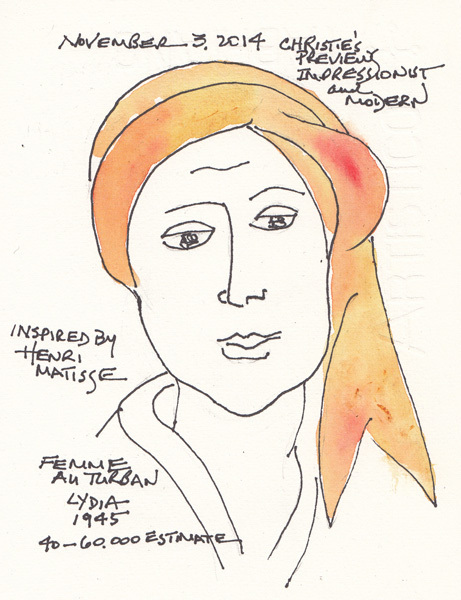 I've been back to MoMA and the Matisse Programs two more times - attending two free workshops set up in the Education Building Studio area. Elaine Reichek, a New York artist took us through the exhibit briefly, highlighting Matisse's designs for scarves and a tapestry, and then provided us with materials and inspiration to make fabric collages of our own. I embroidered a felt collage shape that I sketched from Matisse's 1001 Nights (in the exhibit) and then layered the felt collage onto cotton and linen with machine stitching when I got home. 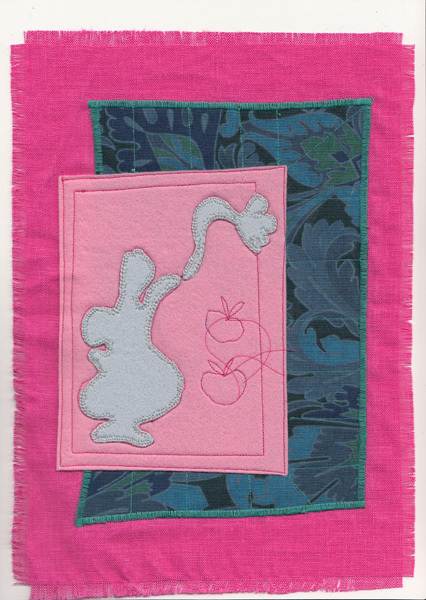 I even fringed the linen and stitched a few pomegranates as Matisse might have done. This week I attended a handmade paper workshop sponsored by the Matisse Education staff and presented by Dieu Donne, a NYC-based Studio. 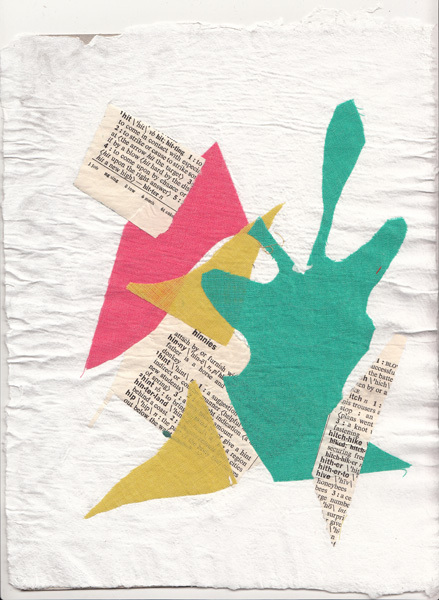 We each made 1-2 pieces of cotton paper and added designs with stencils and pigment, or paper/fabric collage, during the paper making process. I made one piece and used colored fabrics and pieces of a dictionary page for my collage. The ripples around the edge are expected when there are materials that have different rates of drying. The grayish color is due to the scanning process - they are actually a lovely edge feature. I was working in the Matisse "Beyond the Cut-Outs" Open Studio after the workshop, just as several MoMA studio staff where adding more fabric pieces to one of the supply bins for us to use. I was mesmerized by 2 pieces of taffeta and immediately used them as the background for a paper/fabric collage I was making. The sketches were done previously by me and I just resized them to use for the collage on the copier that is available in the Open Studio. I machine stitched the layers together at home to finish them. Two years ago MoMA had an Open Studio in conjunction with two large Print Exhibits and I was there 8 times over 2 months. I find that it is pure play - the materials are not mine, there are many supplies that are inspiring, and color copies of our projects are added to several large boards, in rotation. 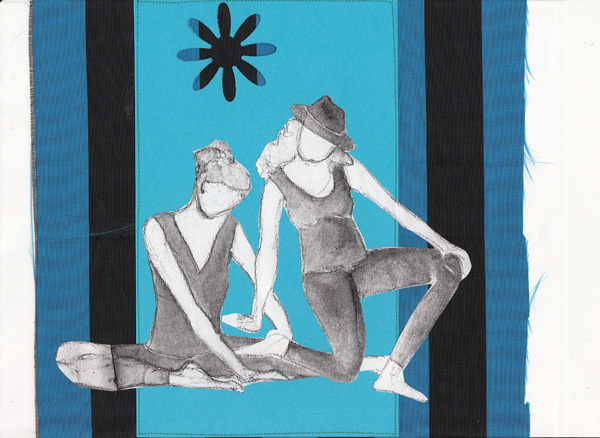 I am also working on a series of dancer collages that I posted in Matisse- part 1. This week I cut up copies of each of them and used them to make another iteration. What next? Who knows what will inspire me next week. I love figure drawing, and I wanted to draw some figures, channeling Matisse. There is a Beyond the Cut-Outs Studio at the Museum of Modern Art every afternoon except Tuesday, so I am trying to build my stash of figures that I can turn into cutouts for collage when I attend. Here are three sketchbook pages. 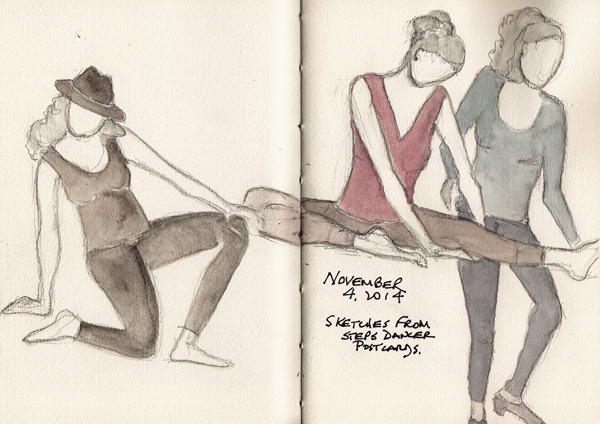 I need to "deliberately practice" drawing hands and feet - and I keep a sketchbook just for that purpose. The poses at the figure drawing sessions are never long enough for me to concentrate on hands, so I clip photos from magazines and use those. I'm HOPING that someday this work will pay off. 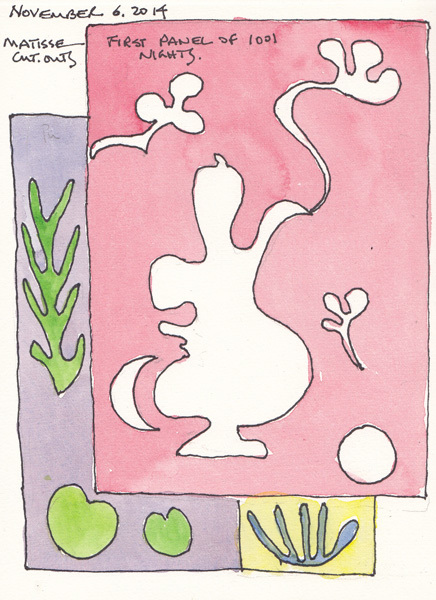 I sketched my favorite drawing at Christie's Impressionist and Modern Auction Preview on Monday, and on Thursday I painted the first panel of Matisse's 1001 Nights in the Matisse Cut-Out Exhibit. He is one of my favorite artists and I love studying his lines. Veronica Lawlor was the teacher for Week 5 in Sketchbook Skool Semester 3. 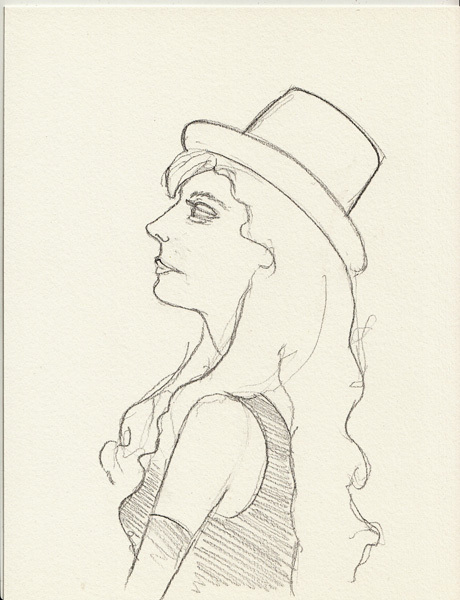 I'm not sure that I will ever be able to draw bodies in constant motion, like Veronica, but I will practice. 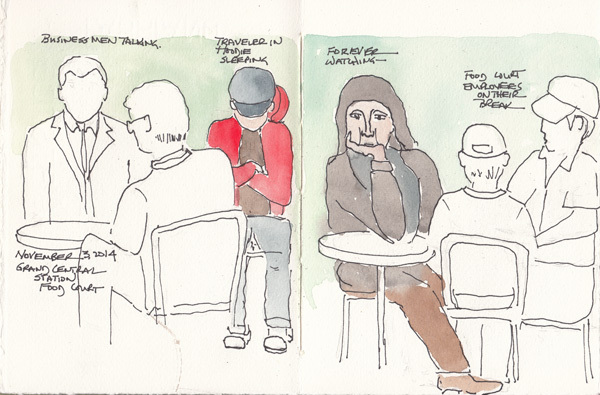 I sat in the Grand Central Food Court this week having coffee and sketched 6 random people - two pairs that were very busy talking to each other, and two others that were either almost stationary or asleep.